April 30, 2013 In a religious sermon at Friday prayers in Qatar, Egyptian preacher and theologian of the Islamic movement ‘The Muslim Brotherhood’, implored America to intervene with force in Syria. 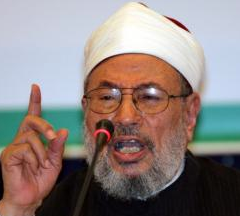 ‘The Syrians are killed every day with heavy weapons and combat aircraft’ complained Egyptian Islamist Sheikh Youssef Al Qaradawi during a sermon Friday at the Omar Ibn Al Khattab Mosque in Qatar. ‘We thank America for the delivery of non-lethal military equipment to Syrian fighters, but this is not enough,’ he proclaimed in the middle of the sermon on the value of prayer in Islam. ‘We implore America to make a move for the Syrian people for the sake of Allah, we ask Americans to behave like men of honor to intervene in Syria as they did in Libya,’, the religious leader of the Muslim Brotherhood urged before the worshippers. It should be noted that Qaradawi and the Muslim Brotherhood dominated Syrian National Council (SNC), a Syrian opposition group, appear to enjoy close relations. Predicting that Islam will conquer Europe through peaceful means. Calling Hitler a divine punishment for the “misdeeds of the Jews” and that the Holocaust was exaggerated. Calling for the death of all Jews. MEMRI has produced two video compilations of Qaradawi’s extremist statements. The first collection contains Qaradawi’s statements about Europe and the US as well as about Israel and Jews. The second collection contains various statements by Qaradawi on social issues such as discussing the killing of homosexuals and stating that beating is “suitable” for some wives. Qaradawi has been banned from entering the US since 1999 and the UK since 2008. Last year, authorities also refused him entry into France. In 2004, Qaradawi issued a fatwa (religious legal opinion) permitting the abduction and killing of American civilians in Iraq in order to pressure the American army to evacuate its forces.